Downtown Parking: Is It Killing Your Town? Everyone seems to know exactly how to make their downtown better: MORE PARKING!!! A few years ago, I read a research article written by a couple of internationally famous transportation and livable cities experts. Part of their work was to survey 32 cities worldwide for the amount of parking and lane mileage provided downtown, and then look for correlations between these factors and both gasoline consumption and the livability of the city. Based on this analysis, they came up with a rule of thumb for a CBD (Central Business District) parking-to-CBD employment ratio. Their conclusion was that beyond 200 parking spaces per 1,000 jobs, the city becomes noticeably ugly, congested, polluted, auto dependent, energy intensive, and deteriorated. When I did an analysis for Gainesville FL (where I was working as a town planner), I was astounded to learn that despite all the rhetoric about insufficient downtown parking, the city has over FOUR TIMES more spaces than this rule-of-thumb ratio. It seems to me that if we decide it is “unreasonable” to expect people to walk a couple of blocks from their parking space, or unreasonable to build multi-story parking garages (with first floor office and retail), the city is in trouble of fouling its own nest. 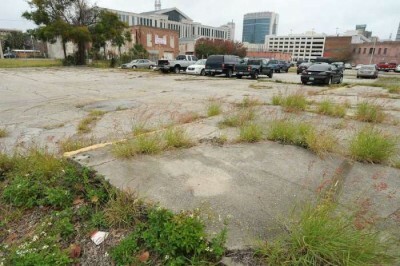 No more downtown parking? Nothing mentioned above should be taken to mean that we should not add ANY form of parking downtown. I’m tired of hearing that canard. I generally support multi-story parking garages, in part because their “verticality” helps define the public realm. And they are especially nice when they include a first floor “wrap” of retail and office (since without such a wrap, the structure has a severe deadening effect). Another enormous benefit of such parking is that it substantially reduces the amount of real estate consumed by car parking. 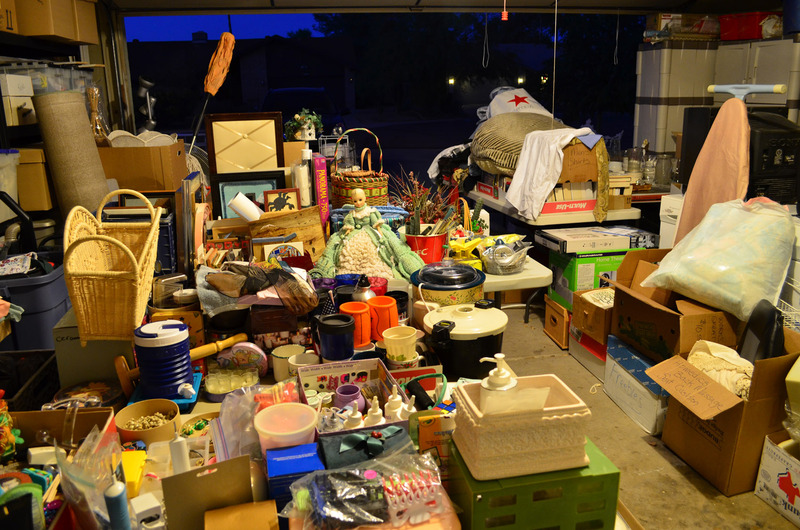 A car parking space consumes an ENORMOUS amount of space (about 350 square feet). Since a healthy town center requires walkable compactness and “agglomeration economies” to thrive, the extreme dispersal of the town center with acres and acres of parking asphalt is a recipe for town center decline. Many town centers around the nation provide insufficient amounts of on-street parking. I support adding as much on-street parking as possible. On-street parking buffers pedestrians from the noise and danger of cars, and helps slow cars to a more pleasant and safe speed. In addition, on-street parking is extremely helpful for retail, since retail does better when pedestrians find a more pleasant place to walk (or enjoy an outdoor cafe), and because the parking provides a handy place to park near the front doors of businesses. 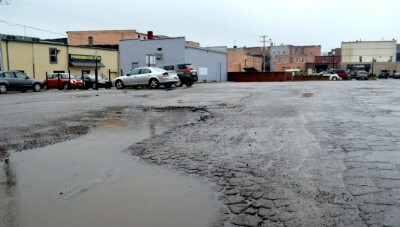 In my opinion, it is OFF-STREET parking (asphalt parking lots) that we need to be careful about downtown. 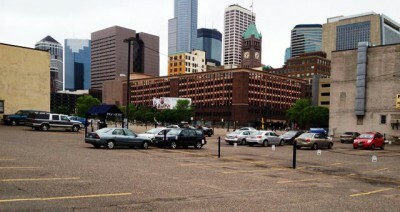 Such parking creates “gap tooth” dead zones that harm the downtown ambiance and unique character, create ugliness, and increase crime and safety problems. The space used for off-street parking is usually better used for residences, retail, offices, or cultural buildings — all of which help enhance the quality of the public realm and build vibrancy (and “agglomeration economies”). We need to strike the proper balance in our efforts to revive the downtown, instead of putting all of our eggs into the off-street parking basket. Quality of transit. Occasionally, people respond to the information I present above about parking ratios by saying that the other cities have higher quality transit, and can therefore get away with less parking. While it is certainly true that the bigger cities have higher quality transit, I believe we need to realize that this is a “chicken and egg” issue. Which comes first? Quality transit, or the conditions that demand the installation of quality transit? While it is possible that we can get quality transit first, it is not probable. After all, we live in a democracy. Our elected officials are not dictators who will take actions that do not have political support. In nearly every city with quality transit, conditions emerged which lead the citizens to choose to support whatever it took to install quality transit. Conditions such as a high cost and inconvenience to drive a car, park a car, or both. In summary, we need to strike a balance between the need to provide parking and the need to create a livable, vibrant, transit-supportive, attractive downtown. A common strategy for “mitigating” (“reducing,” for those of us who speak Plain English) the negative traffic impacts of a proposed Big Box retailer such as Wal-Mart is to require the retailer to pay to widen roads or intersections that serve the store. Doing so is thought to do two things. First, it is thought that such “improvements” will allow the community to avoid traffic congestion caused by the giant retailer. Second, there is a dream that doing so will stop the retailer because the company will not be able to afford to “improve” the road/intersection. A quick aside: Calling a road or intersection widening an “improvement” is inappropriate. While there might be a brief improvement for motorists, such widening is a degradation for bicyclists, pedestrians, and transit users. Is it a good idea to require a proposed Big Box retailer to pay for a bigger road or intersection? In my view, doing so is the worst possible thing that can be done for a proposed retailer. “Easing traffic flow” is precisely what a huge retailer wants and needs, since they are striving to serve a regional population of consumers. They are striving to make things as convenient as possible for as many motorists as possible. 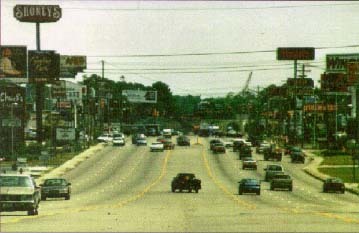 Therefore, anything which “eases” traffic flow is an enemy of nearby neighborhoods, the community, and overall quality of life (largely because it would induce huge volumes of new car trips from all over the region – car trips that would have never occurred had the road or intersection not been enlarged). 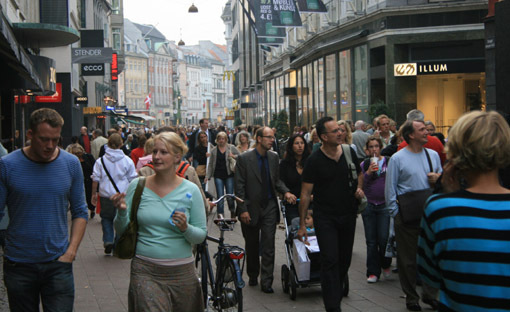 Especially in town centers, streets must be designed for modest, low-speed car travel. Traffic calming, on-street parking, landscaped bulb-outs and landscaped medians can be very useful. A connected street network is essential, as it slows car speeds and provides travel route choices. Effective, quality low-speed design obligates motorists to pay attention when they drive. To be careful when they drive. Using the conventional, free-flowing design model, motorists are encouraged to drive too fast, too recklessly, too inattentively. While driving in such “forgiving” places, motorists are enabled to put on make-up. Talk on the cell phone. Eat a sandwich. Why? Because the street design allows the motorists to pay less attention. The result is dangerous, inattentive, high-speed car traffic. Oversized streets or intersections make an area totally unwalkable. Quite unsafe, particularly for seniors and children. It becomes much more of a car-only place. It becomes, ultimately, an Anywhere USA indistinguishable from any other strip commercial area in the nation. Essentially, the street design vision of a community – particularly its town center — should be to create a “Drive To” place that is walkable and safe, rather than a “Drive Through” place that enables large-volume, high speed traffic. Only big retailers want (and need) the latter. As for the thought that big retailers will be stopped if expensive road and intersection widening is required, don’t fool yourself. Big retailers have big pockets. Typically, even relatively expensive road and intersection modifications are pocket change for the big retailer looking to cash in on a prime market. “Suboptimization” occurs when efforts are made to achieve a lower-order goal to the detriment of a higher-order goal. A common instance of suboptimizing is when there is a single-minded effort to reduce fire truck response times, and doing so to the detriment of peace and quiet in a community (and to the detriment of traffic safety). A study has found, for example, that using excessive street geometries to speed fire truck response time results in a net increase in injuries and deaths, as the number of people saved from fires by faster fire trucks is overwhelmed by the big jump in car crashes due to excessive street dimensions. When I was a town planner in Gainesville, Florida, I experienced what is surely a very common national occurrence: obsessively and emotionally suboptimizing on trees, to the substantial detriment of a walkable city. During my time as a planner in Gainesville, I was forced to cram in several confusing, silly sentences in my “traditional neighborhood development” (TND) ordinance — designed to create a compact, walkable neighborhood — describing “engineered soil” (said by some to be needed for relatively large trees). Not only was the definition inherently confusing and complex. I was told by a number of local landscape architects that such soil would be quite expensive to install. So the TND ordinance, which was already too onerous for a rational developer to use to build a subdivision, became even more difficult to use by developers because city-hating Gainesville citizens and elected officials wanted enormous trees above all else (including walkability). This is yet another reason why we don’t see developers building walkable places. Huge trees are quite often incompatible with a modest, walkable, human-scaled building-street-sidewalk design. And a large number of Americans have strong emotional feelings toward protecting trees. The tree suboptimizers also won another battle. I was directed to amend my walkable town center ordinance (somewhat similar to my TND ordinance) to make street trees a requirement in the Gainesville town center. Like most cities, Gainesville had properly exempted developers from needing to install tree landscaping in the town center, as the town center tends to require compact, human-scaled spaces to deliver the charming, quality urbanism we seek in a town center. The new suboptimizing rules ended up requiring that developers jam street trees into all developments and redevelopments in the town center. This added additional complexity, burden, and confusion to the ordinance, and added another disincentive to build or infill in a town center that has long been sorely in need of development and redevelopment (as so much development was being strongly pulled to sprawl locations). At the same time, I learned that the new county courthouse parking garage planned for the Gainesville town center would NOT be getting desperately needed on-street parking (one of the most crucial amenities for pedestrians) along the garage. Why? Surprisingly, it was not for the goofy fears that kept on-street parking away from the courhouse itself. In that case, the embarrassing reason was that there was a childish worry of truck-bombing terrorists (which, coincidentally, also just happened to be in the interest of motorists who dislike being slowed by on-street parking, by the way). No, on-street parking next to the garage is not going to be stopped because of a fear of Timothy McVeigh. On-street parking was stopped because the City desperately wanted big trees. For the record, on-street parking and trees could be deployed together, but trees such as palm trees are “unacceptable” by those who wish to suboptimize tree ecology for quality walkability. The end result was predictable and nearly certain: Gainesville would soon amend its walkablility codes (in particular, the two ordinances I mention above, as well as walkable ordinances for student-oriented neighborhoods adjacent to the University of Florida) to push buildings back from the street — so that the human-scaled sense of enclosure is lost — or discourage desperately needed in-town, infill, walkable development. I’ve stated this over and over again in my work as a town planner: In the town center, the needs of pedestrians come first. NOT the needs of live oak trees. But only if we care about having a walkable, healthy downtown. The lush landscaping looks wonderful from your car windshield as you whiz by in your car in Atlanta and Gainesville. But where are the pedestrians? Why are they not out walking? Isn’t it enough that we provided a lot of shading live oaks??? I was left to wonder: Was there ever a time over the past 30-40 years when Gainesville had not suboptimized on big trees as the number one priority? Has suboptimizing live oak trees done anything to stop us from taking big steps toward becoming a sprawling auto slum? Has that done anything to promote walking on our sidewalks? Is it any wonder that the anti-city, tree-suboptimizing attitude in America led to such a nearly universal development of cities throughout America that are utterly unwalkable, uncharming, and unlovable? A nation with cities that only an Oldsmobile could love? Over the past several decades, Americans have increasingly cocooned themselves. As the fear of crime (and “strangers”) remains high, many spend more time than their parents and grandparents inside the private realm of their homes – homes that are increasingly becoming walled, fortified, burglar-alarmed fortresses on cul-de-sacs. Many have fled from the more communal, compact town center neighborhoods to dispersed, low-density sprawl neighborhoods. Some of us live within “gated” communities where a guard grants permission to visitors wanting to enter the “compound” of a walled-in neighborhood. The move toward the private realm is a form of escape from public life. I believe the desire to escape is driven, at least in part, by the increasing misery, barren-ness, and danger associated with the relatively awful American public realm. As the public realm becomes increasingly dreadful in these ways, we have almost completely lost any sense of community, or the common good, or any form of civic pride. Of course, some might point to the jingoistic pride that is often exhibited (flag waving, “USA! !”chants, etc. ), but I think that most of that sort of national “pride” is largely associated with the fact that our cheap energy economy is able to deliver a cornucopia of consumer goods (and political freedom, which has lost its meaning because there is no one worthy of our vote) to even those in the lower classes. Indeed, many, many people, in my opinion, mistake the ability to buy a bunch of consumer goods with political liberty, freedom, and quality of life. The end of cheap energy, I believe, will lead to big increases in political turmoil fueled by economic resentment and economic misery. Scarcity and the high costs associated with that will, I hope, compel us to be more interested in and drawn to community and the public realm, and less focused on an “all about me” attitude. As a side note, I was horrified a number of years back to see a quote from a University of Florida student in the College Park neighborhood in Gainesville, Florida. The student was being cited by City Codes Enforcement for his unkempt, littered yard. He told the officer that he had a right to have his yard be a mess because of the political liberty that Americans enjoy. In my travels in Europe, by stunning contrast, I am invariably completely astonished by the magnificent, ornamental, historic civic buildings, public squares, and shops that I see nearly everywhere I go. The public realm, unlike the downwardly spiraling and increasingly neglected place of misery that so many Americans are fleeing, consists — in the older parts of European cities — of places worth caring about. In these charming, romantic, human-scaled sections of Europe, one finds it fantastically rewarding to walk the livable, human-scaled streets — many of which were bustling places filled with pedestrians and busy shops and outdoor cafes. The vitality is contagious. And powerfully rewarding, because the human species is naturally sociable, yet as an American I so rarely can experience it in public – in American cities and suburbs. Nearly everyone on the European streets seem to be friendly and happy and sociable. It is so very exciting to me to see the enormous number of people walking and bicycling on very narrow, cozy streets. Traveling without a car is clearly and dramatically more humanizing for the Europeans. In a car, even the most mild-mannered, friendly person is often compelled to get angry at “slow-pokes”, or to fume about pedestrians and other cars in the way, or how long it takes for the signal light to change. Blood pressure rises. Fellow citizens become enemies in a competition for road space. The ability to offer a friendly “hello” to your fellow citizen is lost inside a car, as is any real sense of SERENDIPITY, which is so important to a rewarding journey. Inside a car, one usually feels as if he or she is always in a hurry. Only as a pedestrian or bicyclist does one experience the unhurried pleasure of taking your time to smell the flowers and enjoy the morning sun. To stop to chat with an old friend you run into. To pop into a store because of something that caught your eye. So the rich, rewarding experiences I so often joyously find in Europe are due to these human-scaled, slow-speed, pedestrian-oriented, activated streets I see there so regularly. Streets full of happy, sociable people, busy shops and cafes, and proud buildings lavishly ornamented. In America, most of what we experience is what Jim Kunstler calls an “auto slum.” Who wants to go for a walk in a place full of angry, high-speed motorists on 8-lane arterial roads, vast and empty asphalt parking lots? The wretched, all-too-common experience of a strip corridor littered with auto repair shops and car dealerships, and buildings that are so far from the road that a person on the sidewalk would need a telescope to see into store windows? Assuming there even ARE windows, since growing numbers of buildings now turn their back to the street. The natural, expected reaction for almost any sane person is to RUN FOR YOUR LIFE from such a place and safely cocoon yourself into your own little private realm, where you can endlessly, pathetically strive to be happy by buying flat-screen TVs, iPods, and luxurious furniture as a surrogate for living in a rewarding community. But how satisfying is it, in the end, to have a stupendous living room, when you don’t even know your neighbor? When all of your “friends” are simply characters in sit-coms you watch every night on TV? When your city is little more than a tangled, dangerous mess of stressed and hostile motorists, highways, parking lots, and fast food chains? Our consumer economy thrives because it is simply not possible to buy things as a way to be happy, yet we feel compelled to buy, buy, buy in our endless, hopeless pursuit of happiness. There is, after all, no alternative, since we have no community or quality public realm to satisfy our gregarious human desires. Advertising constantly tells us that we will feel so much joy if we buy their product. But we learn that buying and owning the latest gadget is, ultimately, an empty, sterile way to live and enjoy life. I’ve heard more than once that the Europeans are destined to a future quality of life that nearly everyone throughout the world will see as higher that the quality of life experienced in America. A recent book is titled “The European Dream” (an illuminating play on the “American Dream” we have grown up with). I am convinced that this transition to looking at older Europe as the new dream is certain, because the European public realm is very high in quality (light years better than the miserable public realm in most all of America), and a quality public realm is the fountainhead to a high quality of life for the entire community. Quality of life is NOT found by buying the latest plasma TV set or SUV.